Too many travelers think of Northern England as a land bridge between London and Glasgow. The north of England is rich in natural treasures like the Lake Districts; historic towns like Chester and York; and some great cities. No northern English city is greater than Manchester where modern life began with the Industrial Revolution and where today that life is enjoying an evolution in creativity and quality of life. Now the sooty mills and row house slums have given way to galleries, theaters and Rock and Roll. Manchester’s Gay Village, located on Canal and Chorlton Streets, is home to one of England’s largest gay and lesbian communities. Still Manchester’s political, scientific, industrial and labor history make what is a hip city, an interesting city as well. The coming Manchester International Festival (July 2 to 19) and Rugby World Cup 2015 will help put the city’s rich heritage on display along with the nearby stately homes and castles, the steam trains and canal boat journeys through the countryside. Liverpool, Chester, Blackpool and the Lake District and Peak District National parks are only an hour away. London is only two hours by train, with Virgin running three services per hour. As the shovels hit the ground in the development of the £800 million Airport City project at Manchester Airport, one of the most ambitious British projects since the Olympics, the city got some very encouraging news. Recent hotel occupancy shows that Manchester is now drawing more visitors than it did before the economic crash of 2008, showing that the city has fully recovered and then some. January through August shows the city center had an average occupancy of 76 percent, a new record. Good news, since the city has 2,100 new hotels in the immediate pipeline; 2,700 if you tally up the new openings in Greater Manchester. “Current demand means that we are now exceeding the rates experienced in pre-recession years, but we are also in the cusp of a dramatic increase in supply to meet this,” said Andrew Stokes, chief executive at Marketing Manchester. 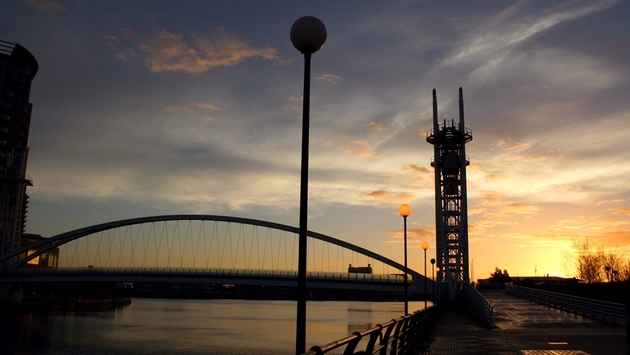 Tourism generates £6.6 billion a year for the Greater Manchester economy. New hotels include the 139-room Hotel Football, which was designed for the soccer lovers, especially Manchester United lovers. Opened in October it has a five-to-a-side football pitch for events. The 208-room Melia Innside Hotel is due in April. On the horizon are the 66-room Gotham Hotel in the city center, the 258-room Yotel, the 350-room Hilton Garden Hotel in Airport City, the 178-room Indigo Hotel, the 143-room Premier Inn Hotel (Budget) and more. The coming Airport City, a joint venture between Beijing Construction Engineering Group (BCEG), Carillion PLC and the Greater Manchester Pension Fund (GMPF) is the core element of a government-designated Enterprise Zone surrounding the UK’s third busiest airport. Manchester Airport is currently used by over 20 million passengers annually, and has flights to more than 200 global destinations. More than 6.5 million people (8 percent of the UK population) live in Manchester and the North West area, accounting for 11 percent of UK GDP. The project will add 4.5million square feet of development, a mix of offices, hotels, advanced manufacturing, logistics and warehousing. This coming spring, a new purpose-built center for international contemporary art, theatre, film and books will open as part of Manchester’s First Street North development. It will be called HOME. Manchester offers an array of themed walking tours departing daily from multiple locations around the city. Some of the newer themes include the Ten Manchester inventions that shook the world which brings together some of Manchester’s remarkable discoveries on an easy walk around the city; the Impossible Bridge and the Improbable Hill tour features cemeteries, strange sculptures, great views and a scramble up the stones that built the city; and various World War I-themed tours.